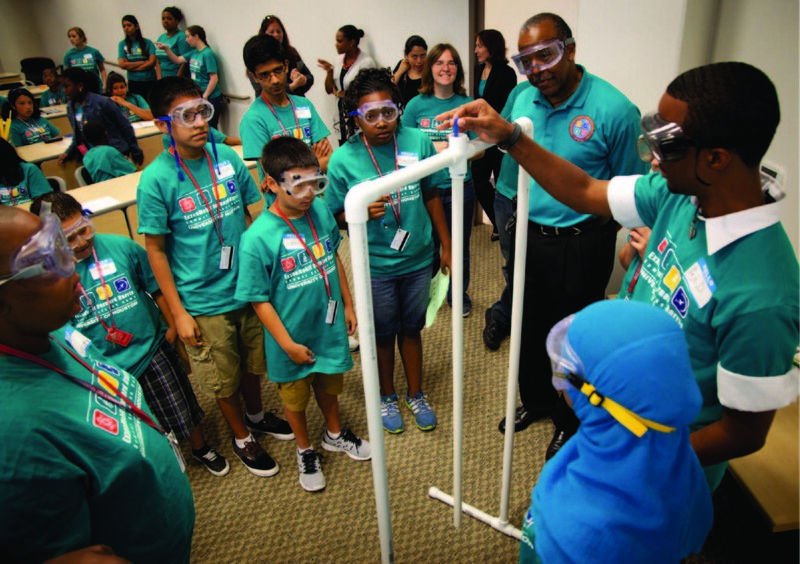 June 19, 2015 – More than 40 middle school students will strengthen their science, technology, engineering and math skills by planning the colonization of Mars during the ExxonMobil Bernard Harris Summer Science Camp at the University of Colorado Colorado Springs. From June 15-25, the students will live at UCCS and use household materials to create spacecraft and participate in a space-themed competition, the Mars Landing Challenge. The competition was inspired by camp founder and veteran astronaut Bernard Harris, Jr., the first African-American to walk in space. He completed two shuttle missions. The students selected for the camp are evenly divided between girls and boys. All come from underrepresented groups, have at least a “B” average in sixth, seventh or eighth grade, score at the median or better in standardized tests, have an interest in science and math and completed a 250 word essay. This is the third year that UCCS has participated in the ExxonMobil Bernard Harris Summer Science Camps. The camp focuses on teamwork and hands-on activities such as creating rockets, measuring roller coaster G-forces, designing Martian habitats and producing 3-D printed parts using specially designed software. Additionally, the students will travel to Garden of the Gods to see math and science at work. The students are taught by university faculty and secondary school teachers who combine hands-on experiences with lessons. The students will also be visited by an ExxonMobil engineer and NASA educator April Lanotte, master teacher, UCCSTeach. The camps are no charge for the students or their families. Costs are covered by ExxonMobil Foundation and the Harris Foundation. Creating an interest in young people to pursue careers in science, technology, math and engineering is a priority for Fitzpatrick and others at UCCS. The demand for workers in STEM areas is high and is expected to increase in the next decade. The U.S. Department of Labor anticipates a demand for more than 250,000 engineering positions in 10 years.